Many Japanese have an unrealistic view of these UN-level groups. They were mediocre to begin with, but are now lapdogs of the Western powers. I believe NHK reported they'll be going to Fukushima Dai ichi tomorrow (27th). I don't have links; saw it on NHK news last evening. Actually all 18 people are from the nuclear PR dept. One of their first acts was to ask Japan to stop making radiation dispersion projections. Chief High MUCKETY-MUCK Dr. Mike Weightman hails from the country with the radioactive pigeon droppings so we can be sure he'll look the other way as much as possible when he's not wearing his nuclear blinders. Don't judge them by their nationality/origin. It's competence and mission objective that matters. However, my expectations are low. The JNN Fukushima webcam is dead again. The French is one of a five commissioners college at the ASN, Authorité de Sureté Nucléaire. Named by the Senate. Engineer, started at the CEA (Commissariat à l'énergie nucléaire) (energy and defense). 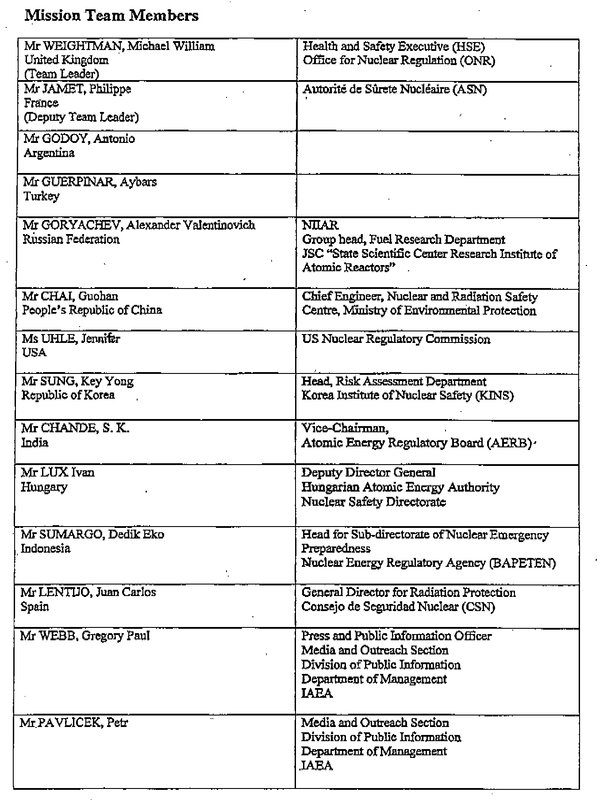 Took part in creating the IRSN, an expertise public establishment on nuke matters, now a technical partner to the ASN. The ASN raised Fukushima level to 6 on the 15th of march. Not to be mistaken : there are many Philippe Jamet in France. That info may be for you only. I don't understand the point. Arguing which environmental catastrophe is worse doesn't get us anywhere. BP and Fukushima are both devastating. The fish don't care whether they die from oil or radiation. The energy sector has co-opted our news media and politics and they are killing our environment with reckless projects and bad management. The next BP oil sipll, the next Fukushima are coming unless we get srious about green energy like wind and solar power. Industrial engineer specialized in energy production at 1982, Madrid, Spain. First work in 1982 related with nuclear energy. 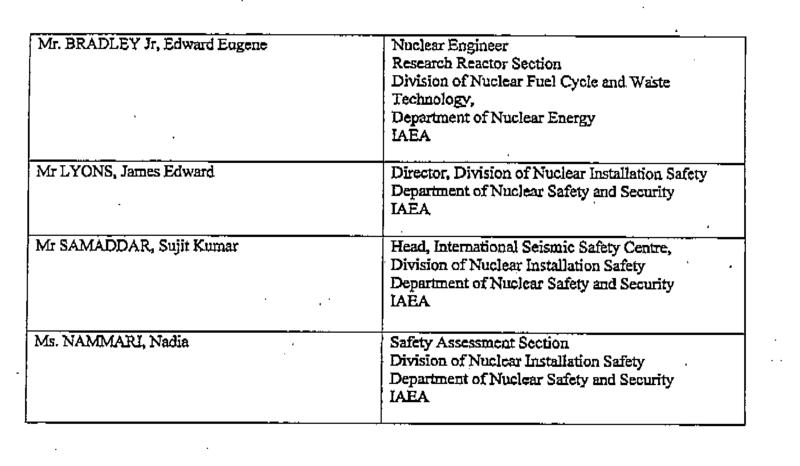 On 1984 he enters the CNS, he has worked there in several positions: Project leader of nuclear plants, Resident inspector of nuclear plants, Emergency subdirector, Subdirector of protection against radiation and his current position. He was interviewed a few times after Fukushima accident. Radio audio, cadena ser (one of the most listened Spanish radio stations) on March 15th: After explaining the situation on that day, he states that the contention of reactor 2 has failed is worrisome although to which extent we still do not know. Release could be of only 5% of the radioactive core. Audio from CNS on May 11th: The situation needs be taken care of but all the reactors and fuel pools affected by the accident are being, although with still rudimentary systems that should be improved in the future, well enough refrigerated. This has allowed the stop of emission of radiation. The situation is stable. Many persons are still evacuated, many of them will probably come back home but we will know more exactly in the future. He has shown previously nuclear conservative opinions: 2009.10.15 The nuclear power stations do not increase the risk of cancer. A study of the CSN denies the relation cause-effect enters the proximity a nuclear power station and to suffer cancer. Are you aware of the secret deal contracted in 1959 between WHO and IAEA. The "expert" from Indonesia is defending building yet another reactor on the Pacific Ring of Fire after not one but two earthquakes that happened years apart damaged nuclear facilities in Japan. This guy sounds just like all the other apologist who depend on nuclear power for their livelihood. *The Muria volcanic complex is a capable volcano. *The proposed nuclear power plant site is definitely within screening distance values for fallout of pyroclastic material, pyroclastic flows and surges, debris flows, lahars, floods, and opening of new vents. *Indonesian researchers have identified two major north-south faults through the Muria volcanic complex. * While there appear to be no capable faults at or near the site of the proposed nuclear plant the nature of the foundation sediments at the site and the high level of ground water raise serious concerns in the face of wider seismogenic conditions. * Indonesian government claims that there are no significant volcanic or seismic hazards attached to the proposed Muria nuclear power plant site are not supported by public reports by IAEA and Indonesian government consultants with access to restricted official studies. * Almost all official Indonesian and IAEA volcanic and seismic studies have been kept from the public domain over more than three decades. * One report which utilized these numerous studies draw attention to significant methodological and data limitations in these studies. *Reliance on earthquake resistance standards derived from earlier Japanese modelling is inappropriate due to great differences between the site's geological conditions and those in Japan. *Japanese authorities no longer use the earthquake safety standards that these reports are based upon. In 2007, they substantially rewrote their safety standards based on their experience of the 2007 Chuetsu earthquake which caused serious damage to a reactor in Niigata. Hi, thanks a lot for your work. Did you get the comment on the spanish comisioner? I though I posted it yesterday but I can find it. I can post it again if you dont have it. A new report reveals that US and IAEA officials knew since March that the Fukushima nuclear power plant suffered a nuclear meltdown within 3.5 hours of the Japan earthquake and hid it from the public.